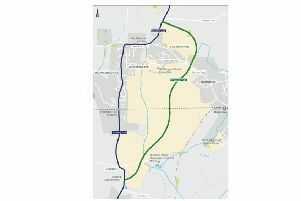 Plans for up to 2,750 homes and a business park north of Horsham could be approved next week as officers have recommended the scheme be approved. The site north of the A264 has been hugely controversial with residents when it was included in Horsham District Council’s planning framework. This was adopted in November 2015 and developers Liberty Property Trust submitted an outline planning application for the scheme last year. It is due to be debated by HDC’s Planning Committee North on Friday (April 28), with officers recommending the scheme be approved. The application also includes two primary schools, site and contributions for a secondary school, community centre, shops, open space, cemetery, land safeguarded for a parkway railway station, and improvements to the A264, Rusper Road and Langhurstwood Road. However questions have been raised about viability studies on the scheme, which are used to justify the level of affordable housing and contributions to community facilities and infrastructure. Figures show the nearly billion pound development is set to net the developers £174m of profit, with the landowners receiving £86m. Although a number of the figures are secret and redacted from reports published on the council’s website, Rudgwick-resident Paul Kornycky has used mathematical extrapolation to accurately reconstitute the numbers. They show that total projected income for the entire scheme is £957m, with the basic cost of building the houses at £400m. But a whopping £143m is due to be spent on abnormal costs and site infrastructure, including access roads, fees, and utility works. This compares to just £22m for off-site highways work and £31m towards community facilities. The scheme is set to deliver just half of the council’s affordable housing target of 35 per cent, with just 18 per cent affordable rented and shared ownership units. Instead 30 per cent of ‘housing for local needs’ includes 12 per cent which is a mix of discount market, private rented, and custom/self-build units. Based on the figures an average market house at North Horsham would sell for £395,710, of which £76,531 per unit is simply to pay for the developer’s profit. Mr Kornycky asked why £143m was needed for on-site infrastructure, whether landowners were taking too large a slice of the ‘planning gain’ take, if £39m finance charges could be reduced by speeding up delivery of the homes, why the developers are resisting the suggestion of a clawback clause if market house prices improve, and whether the 20 per cent profit margin on the market homes could not be reduced slightly. He said: “This massive development will change the face of Horsham for ever. Let us hope that despite the extremely poor hand our district council has been dealt by the Government with the NPPF [National Planning Policy Framework] giving developers licence to destroy our heritage, under cloak of meeting a widely accepted need for more housing, this deal can be improved.